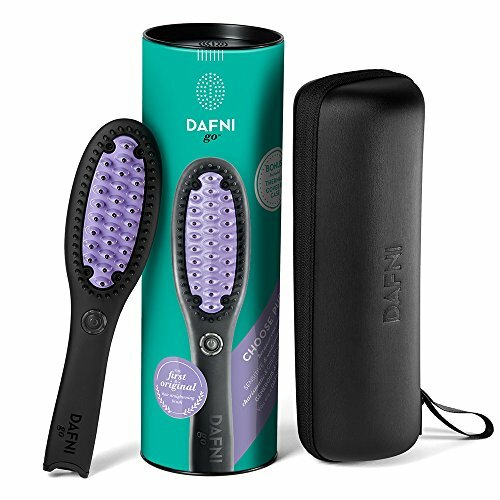 【Hair Protection】: The hair straightener brush releases rich negative ions which helps in eliminating frizz, knotting and split ends. 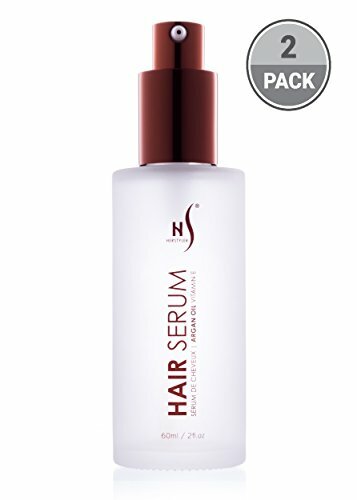 This helps in improving the overall quality of the hair, resulting in a much smoother and healthier hair which is easy to manage anytime, anywhere. 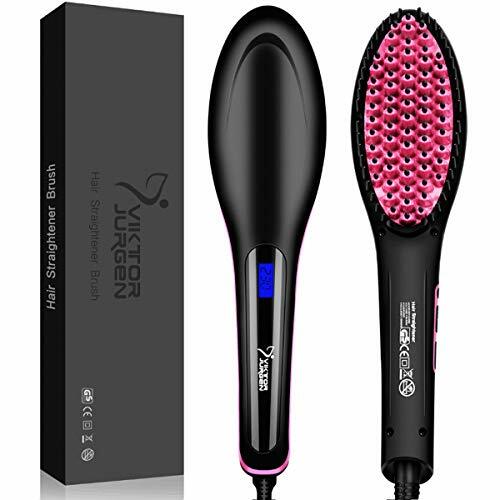 【30-40 Seconds Heat up】: Most straight hair brush take a long time to heat up thus wasting the time of the user all the while increasing the electricity bill cost. 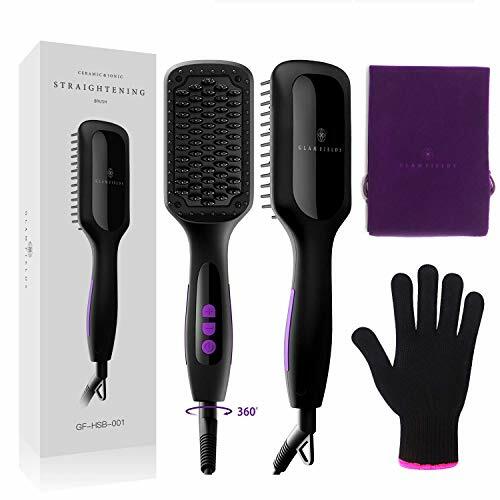 GLAMFIELDS Hair straightening brush heats up within 30-40 seconds thus saving time and energy. This is possible because of its MCH technology which improves the overall user experience. Its wider structure and denser comb teeth help reduce the time for straightening considerably. 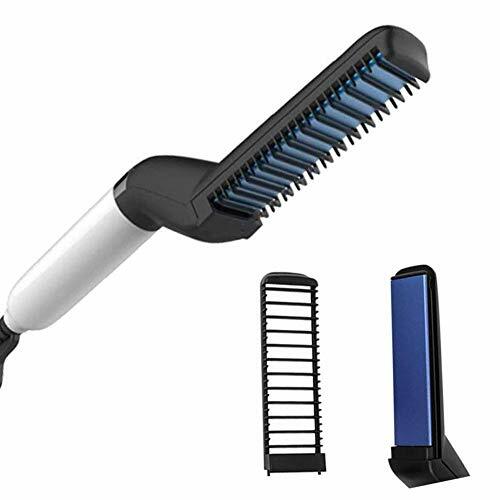 【Safety Controls】: The GLAMFIELDS ceramic straightening brush is equipped with the auto shutdown and temperature lock features to ensure maximum security and optimum performance at all times. Temperature lock ensures that there is no abrupt rise in temperature that can harm the hair. The device auto shuts off if it is not used for continuously 30 minutes thereby preventing any energy wastage and prolonging the life of the machine as well. 【Easy To Use And Clean】: The GLAMFIELDS hair straightening brush should not be washed with water under any circumstances and should only be cleaned with a brush stained with alcohol. As alcohol is highly volatile, it disappears quickly and does not cause damage to the instrument in any manner. 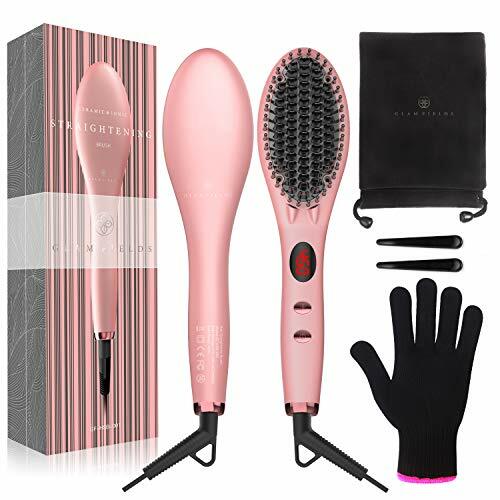 However, one to keep in mind is that there is residual heat after using the device, so it is best to keep the GLAMFIELDS electric hair brush in the open for some time before storing it safely. Volumize hair, flatten side hair & straighten curly hair. No hair damage: Even heat avoids any "hot spot" to overburn your hair. 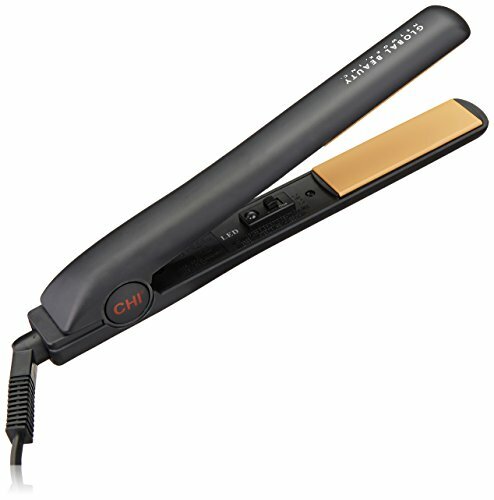 Safe to use: The comb acts as a protective cover against the heating plate to prevent hair from overburning. Easy to use: Just comb to fix your messy hair. Reduce frizzing & detangling. Long-lasting: Amazing effect maintained throughout the day. Lightweight & ergonomic handle:Comfortable to grip without feeling tired easily. 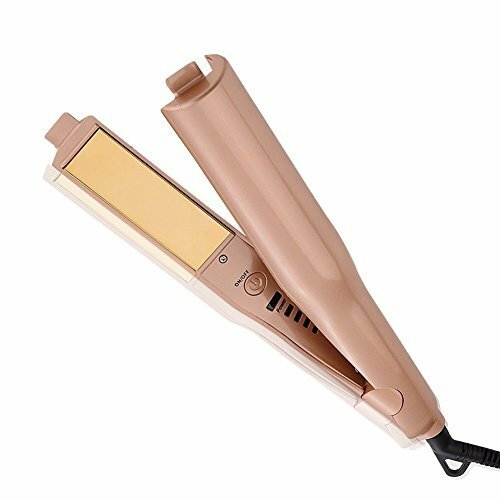 Automatic Release Negative Ions,2 in 1 Twist Straightening Iron hair Curling Iron,3D Concave and Convex Titanium plate New Design Gold. PTC heating model and titanium plate create a shinier, silkier finish in lesser time and eliminates frizz for longer time with less damage. Heats to 4 consistent and steady degrees levels for different quality hairs. 140℃(284℉), 180℃(356℉), 200℃(392℉), 220℃(428℉). QUALITY ASSURANCE:We promise each product from YEJEN is under great quality control,we have IQC/QC/QA keep supervising every single process. ✅ 60 DAY MONEY BACK GUARANTEE - We're so sure you'll love your new ceramic straightener that we'll let you try it risk-free for 60 days. If you're not fully satisfied then just return it to us for your money back - no questions asked. 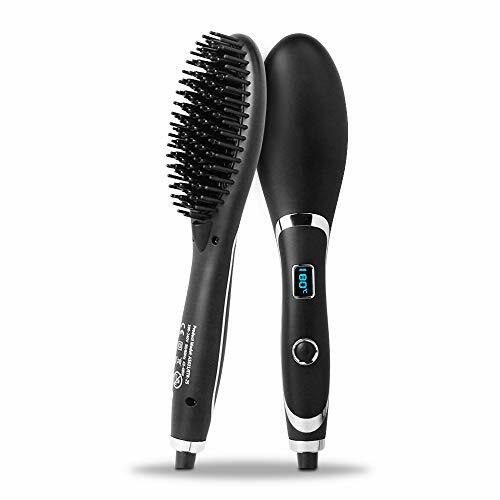 ❤Multifunctional hair styling brush- Volumize hair, flatten side hair & straighten curly hair. 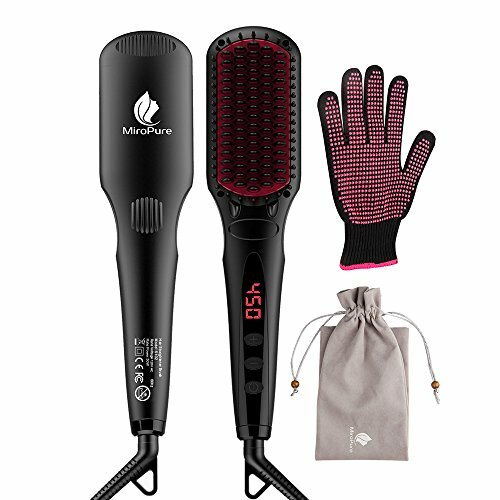 Multifunctional hair styling brush, combines heating barrels and comb teeth for hair smoothing, straightening, curling and creating beautiful volumes, meets your needs for different hair styles. 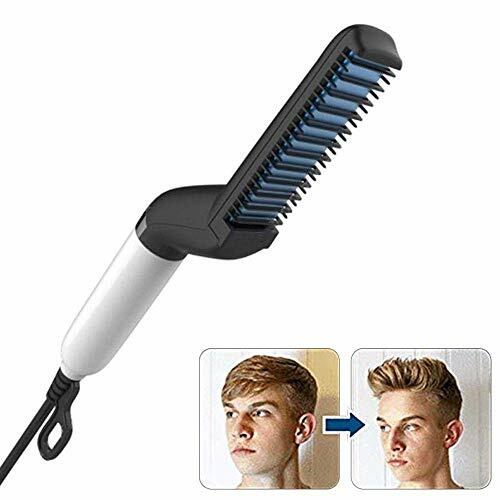 ❤Safe to use-The comb acts as a protective cover against the heating plate to prevent hair from overburning,Innovative 3D anti-scaled encircled protection design The comb acts as a protective cover against the heating plate to prevent hair from overburning. 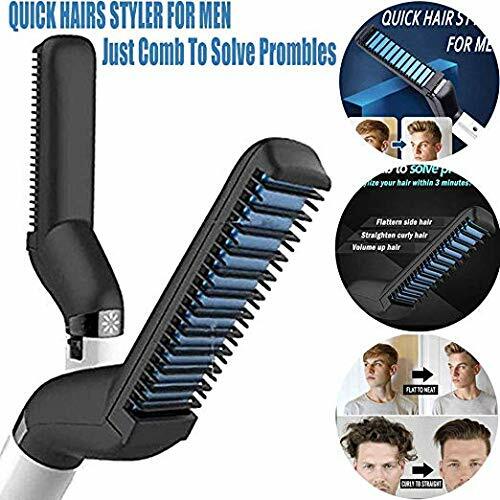 ❤Easy to use- Just comb to fix your messy hair..Straight hair curling, quick hair style in minutes, abundance of hair, smooth side hair and straightening curls, reduce hair loss and untie. ❤Quick heating- Preheat within 15 seconds.Uniform even heating heat can avoid any "hot spots" overburning hair, Professional and time-saving.Ceramic coating negative ion barrels and comb teeth, protects your hair and seals in moisture for natural shine. ❤Lightweight & Healthy- Comfortable to grip without feeling tired easily. 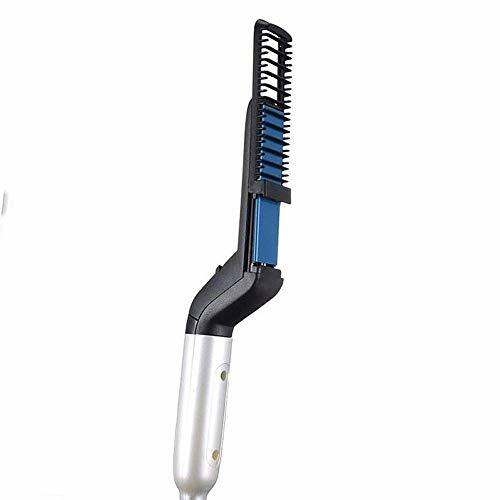 This hair Straightening/Curler comb can promotes blood circulation when use,The blood cells to rejuvenate skin and hair cells which reduces dandruff. 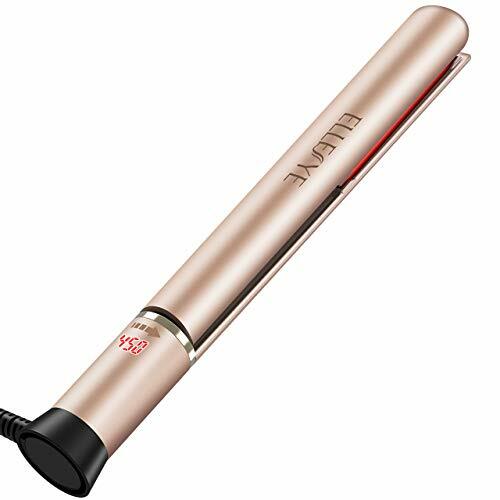 vibrating function promotes blood circulation which makes hair healthier and stronger. 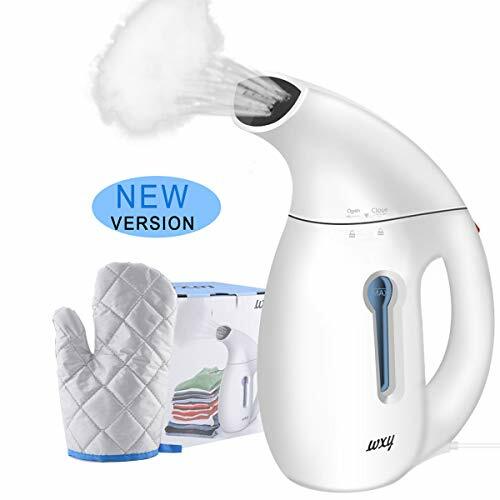 [&#x1F33C; MULTIFUNCTION STEAMING, DISINFECTION & CLEANDING] - The clothes steamer can be used more than a and traditional iron. It removes stubborn wrinkles and sterilizes clothes by powerful and continuous steaming. Refresh long-in-storage toys, fabrics, and irons curtains for a fresh new look in no time. Sterilize sofas, beds and other fabrics around the house. [&#x1F33C; SAFE & ANTI-DRIP DESIGN] - The powerful handheld garment steamer with safe leak-proof design allows you iron clothes even when laid flat. No spill or spray water. 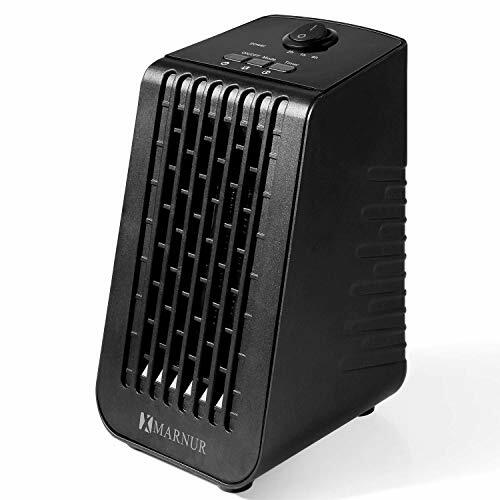 The clothes steamer has over- heating protection, it will automatic shut off if the temperature inside more than 145 F.
[&#x1F33C; HANDY & EASY TO USE] - The compact size and light weight makes the mini steamer comfortable to hold. Suitable to Business Travel. You just move the mini steamer across the fabric from any angle. 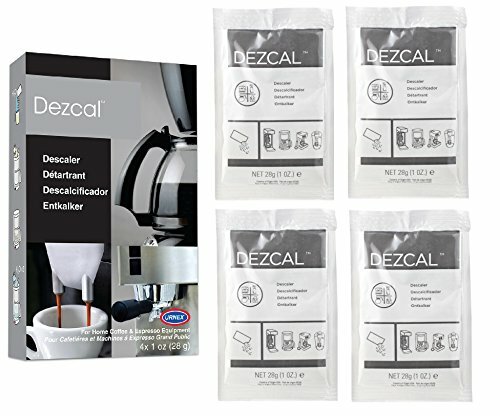 It doesn't get hot while steaming, simple to use. 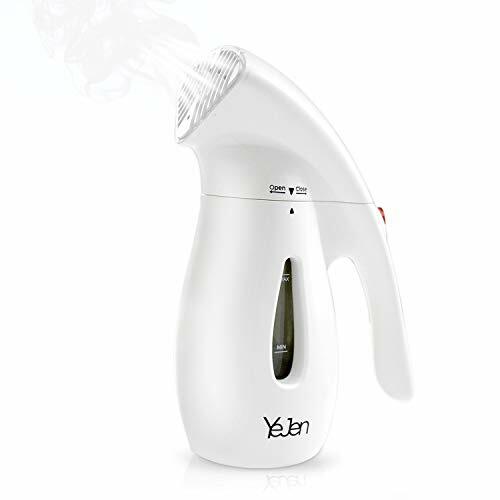 The electric steamer has a powerful power of 900W It heats up just within 25~30 seconds. And the 145ml large water tank provides up to 13 minutes of powerful continuous steam for effectively de-wrinkles. [&#x1F33C; FREE STEAMING ACCESSORY] - Fabric brush ideal for cleaning visible dust from deep inside fabric. The garment steamer is versatile for handling all types of fabrics including cotton, wool, polyester, plush, silk, fiber, nylon, velvet and linen. Compact size and light weight make this travel garment steamer ideal for travel or business trip. [&#x1F33C; WARRANTY] - CUSIMAX offers an excellent 30-day worry-free return policy and an 18-month warranty, we are happy to offer a replacement or refund when machine fails, our customer service will be online all the time to help you. All CUSIMAX products are protected by US Product Liability Insurance. See the instruction manual for details. 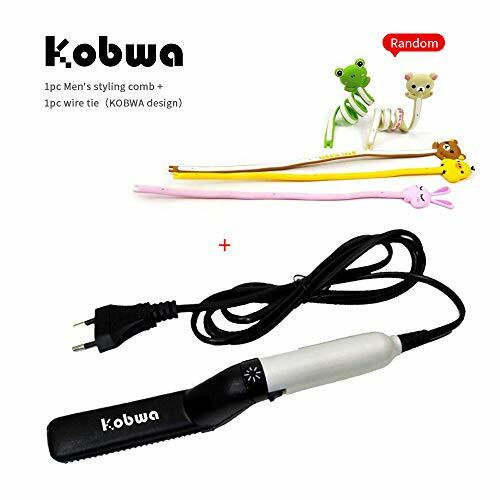 &#x1F195; [2018 NEW-designed] - Multifunctional hair styling brush, combines heating barrels and comb teeth for hair smoothing, straightening, curling and creating beautiful volumes, meets your needs for different hair styles.Please chose our product with Kobwa cartoon wire tie as a gift offered by Ocean Seventh US [OC7]，Official price 12.98USD!!! 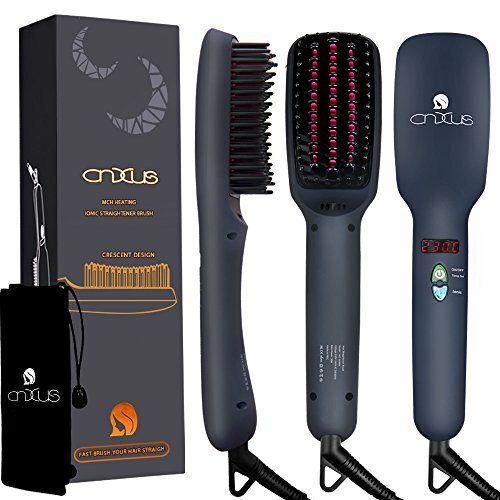 Unique Design Hair Styling Brush: The brush combines heating barrels and comb teeth for hair smoothing, straightening, curling and creating beautiful volumes. 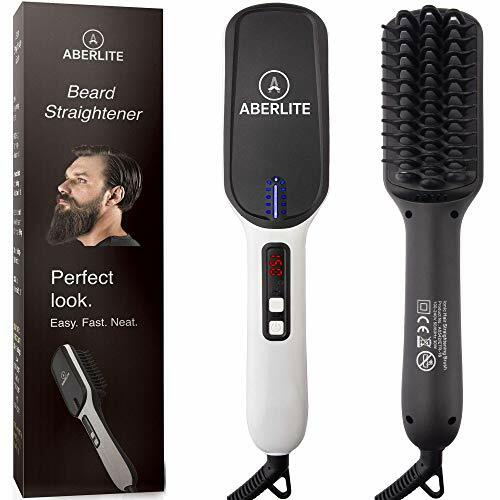 Multifunctional Hair Styling Comb: Volumize beard & hair, flatten side hair & straighten curly hair. Healthy for Your Hair: This hair Straightening/Curler comb can promotes blood circulation. Vibrating function promotes blood circulation which makes hair healthier and stronger. 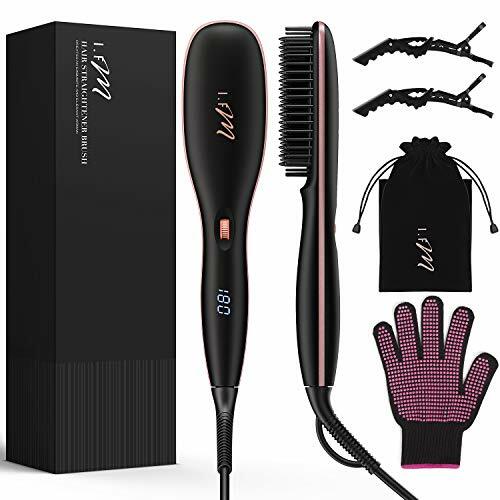 Safe to Use: The comb acts as a protective cover against the heating plate to prevent hair from overburning,Innovative 3D anti-scaled encircled protection design, Non-slip & upgraded thermal-insulation grip and cool-tip. 100% Money Back if you not satisfied your item, just please feel free to let us know by e-mail. PERFECT FOR TRAVEL - This lightweight and compact design makes this ideal for travel and on-the-go use. Fits easily in a suitcase and can be transported easily wherever life takes you. The extra long 6.5 foot power cord makes it extremely accessible no matter where you are. 100% LIFETIME REPLACEMENT GUARANTEE! - If you ever have issues with your Pro Steamer, simply contact us, and our professional customer service team will rush a replacement to you FREE FOR LIFE! EFFICIENT TECHNOLOGY - Equipped with a powerful 900 watt heating element that efficiently sterilizes, cleans and irons your clothes, linens and curtains. Absolutely no ironing necessary. High temperature steamer is ready to use in less than 60 seconds to save you time and effort while producing amazing results. ADVANCED SAFETY DESIGN - The remarkable design of this clothes steamer prevents tipping and spillage, ensuring your cleanup is quick and easy. The unique nozzle design prevents water spray while providing maximum steam distribution. The tank has a capacity of 6 fl oz and will auto cut-off when it is empty. SIMPLICITY AT ITS BEST - Don't stress or complicate removing wrinkles from your clothing. This steamer can handle your ironing needs with no trouble. Not only does it leave clothing or fabrics wrinkle-free, it also neutralizes unpleasant odors. 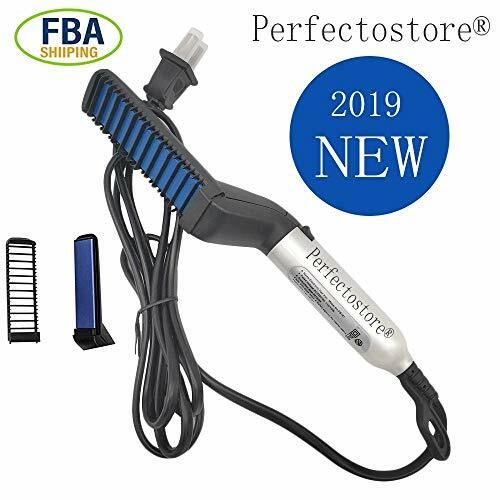 ★ [UPGRADED BEARD STRAIGHTENER 2019] The Quick PerfectoStore Beard Straightening is the first men's heated straightening brush, New designed exclusively for 2019 to smooth out facial hair for an effortlessly soft finish. 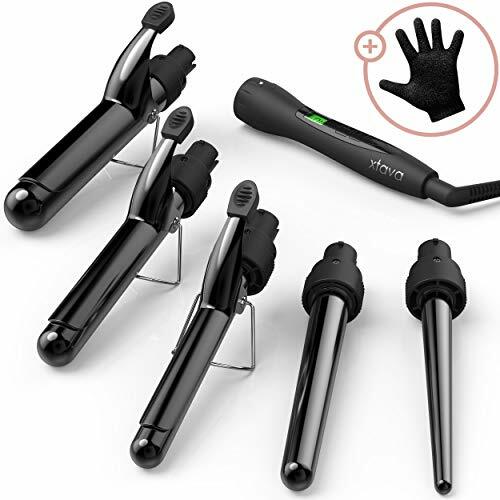 ★ [MULTIFUNCTIONAL HAIR STYLING BRUSH]: combines heating barrels and comb teeth for hair smoothing, straightening, curling and creating beautiful volumes, meets your needs for different hair styles.Straight hair curling, quick hair style in minutes, abundance of hair, smooth side hair and straightening curls, reduce hair loss and untie. ★ [SAFE & EASY TO USE, NO HAIR DAMAGE] - PTC instant heater heats up in 15 seconds,uniform even heating heat can avoid any "hot spots" overburning hair,temperature levels: 375 - 420℃, Professional and time-saving. Ceramic coating negative ion barrels and comb teeth, protects your hair and seals in moisture for natural shine.Just comb to fix your messy hair. 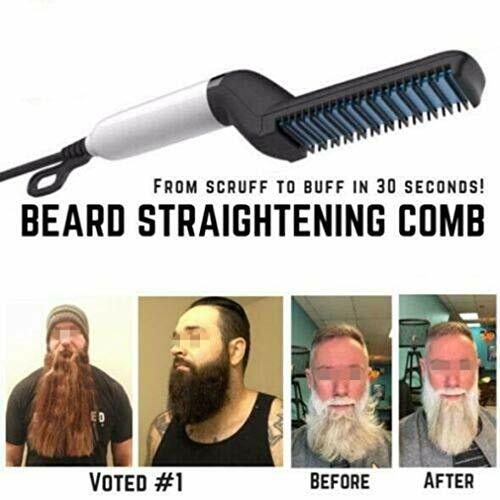 ★ [PERFECT TOOL TO RESTORES YOUR HAIR OR BEARD] Combining the functionality of a hairbrush with the power of heat, the Quick Beard Straightening restores your beard to masculine, groomed perfection in just 30 seconds. ★ [MONEY BACK GUARANTEE & DISCOUNT OVER 50%] - A Perfect Gift for Father day, Your men or your boy. PerfectoStore Tools 100% Money Back Guarantee for 30 days, No questions asked. FAST HEATING: Ultra-fast heating in 70-80 seconds. Large 180ml capacity and a 2.4m long cable, continuous steam distribution guaranteed for 8-10 minutes of use. WORKS ON DIFFERENT FABRICS: The WYFF clothes steamer works not only as a clothes straightening tool, but also works on suits, sofas, bedding's, curtains, carpets, automotive interior and many more! Fabric, cotton, nylon and other types of clothes can be smoothed well by this mini fabric steamer. VERSATILE AND PORTABLE: The fast-heat steamer is an ideal wrinkle remover for travel and storage friendly. 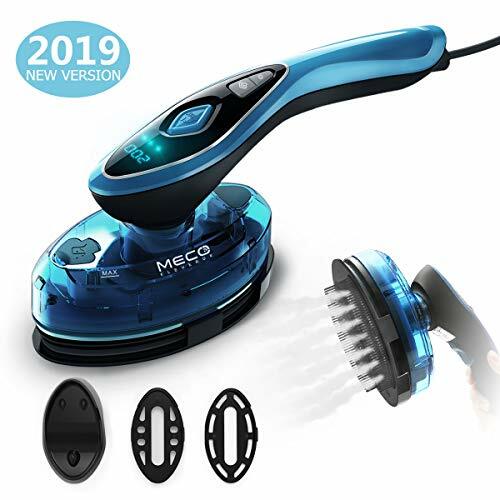 Packing it in your luggage and look elegant everywhere you go.This Handheld Travel Dress Steamer provides you with a firm, steady grip, allowing you to handle it effortlessly,much easier to use than traditional iron handheld. 100% SATISFACTION GUARANTEE: It is a good choice to use this great travel garment steamer as gifts to your friends and families. Beautiful modern looking and good quality, we provide the 30 DAYS MONEY BACK GUARANTEE and 365 DAYS worry-free warranty. FAST & OPTIMUM HEATING: 3D floating plates with ceramic heating allow flat iron to heat up to 360 DegreeF in 30 seconds and with balanced heating technology, save your time and give your hair optimum heat, with smooth and shiny-looking hair. 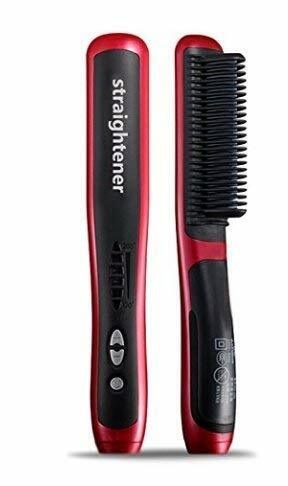 Ideal for both straightening and curling. ANION HAIR PROTECTION: With tourmaline technology, emits negatively-charged ions to make hair extra smooth. Taming the thick hair, frizzy hair and split ends. The straightening iron smoothly glides through hair at ease, no snagging. Get it silky and frizz-free. WORLDWIDE UNIVERSAL VOLTAGE: Not only with dual voltage, 100V to 240V allows you to use more convenient in all countries. Just with a plug converter, you can travel around the world with this one inch flat iron plate. INTELLIGENT SECURITY DESIGN: The temperature displays on digital LCD screen, convenient to design your hair style in a optimum temp. 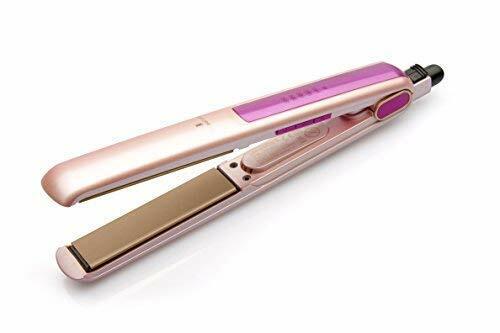 Adjustable temperature hair straightener suitable for all hair types, to help protect your hair from heat damage but add shine. One inch plate width enough for any length, both thick and thin hair. PURCHASE GUARANTEE: We are committed to providing high quality products and good service. With one year product warranty, welcome to contact us if you have any concern and our 24-hours friendly customer service will assist you with any concerns. 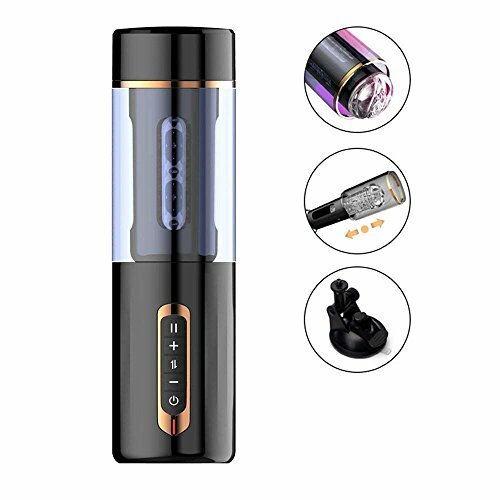 4 Heating Setting: There be four different temperature levels from 330˚F to 450˚F (170°C -230°C), to provide you with total control for all your hair condition and hair styling needs. 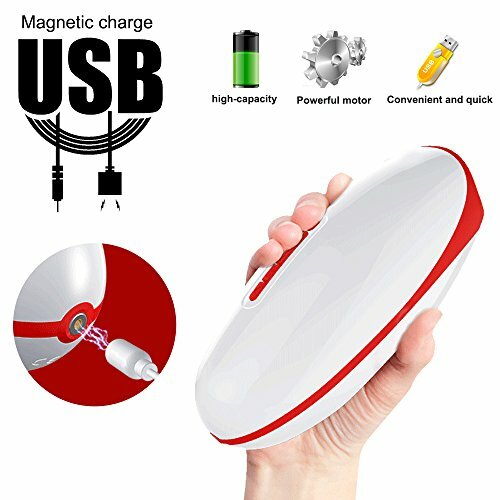 Travel adapter do not convert the voltage, OURS DO！ BONAZZA travel adapter converter combo is the smallest and lightest to date for use with U.S. and Canada Electric Products abroad like hair dryers, steam irons, electric kettle, laptop, iPhone, MacBook etc. 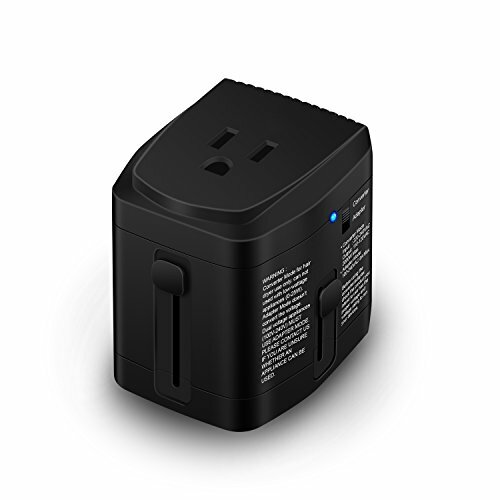 This travel converter and adapter combo is 2000 watts max. Adaptor mode for DUAL VOLTAGE (110-220V, 100-240V) devices, such as iPhone charger, iPad charger, Laptop, MAC. Converter mode to convert the foreign electricity from 220-240V to 110-120V for single US voltage Electric Products. Very Safe: comes with LED power indicator, plug lock system, over-current (overload), high-temperature, short-circuit and surge protection built-in. Please read the introduction and description carefully before using this product. Unconditional lifetime warranty without any other costs needed. 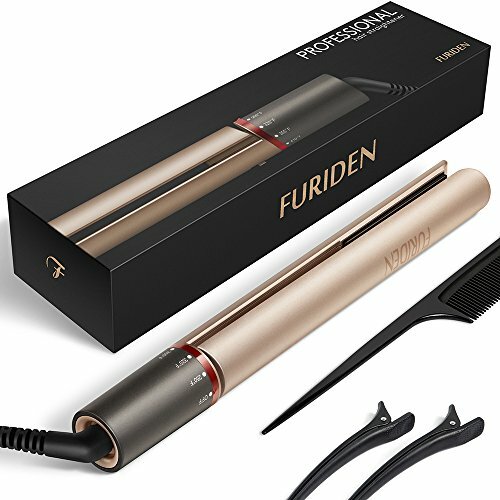 【 LESS TIME 】FURIDEN best flat iron with MCH, a new heating standard for hair appliance. 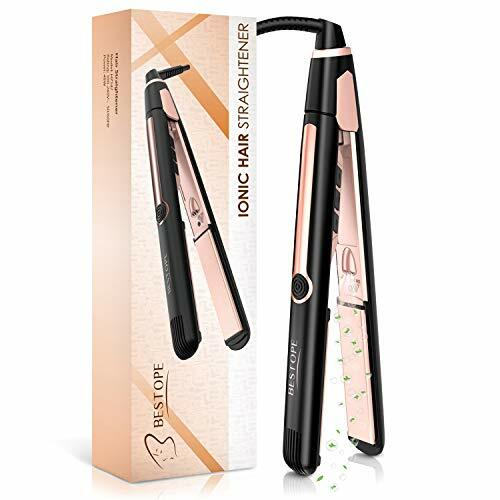 This flat iron curler heats quickly in 15s, Save Energy, More Durable, Lasts Longer, significantly reduces overall straightening, hair styling time compared to conventional hair straighteners. ANTI-SPILL DESIGN - prevents hot water from leaking out with its anti-spill construction and a specially water tank inside, even at awkward angles of more than 80 degrees. Among irons and steamers, definitely our favorite small steamer! 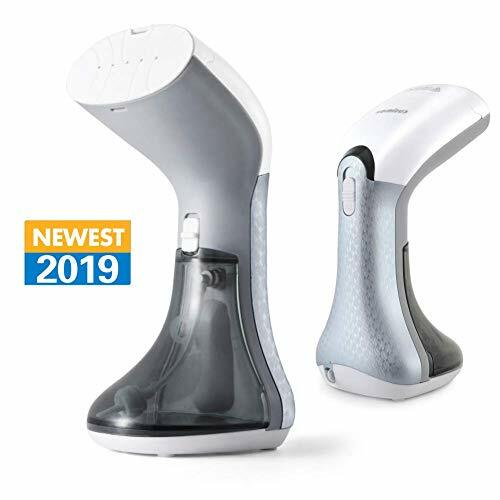 COMPACT and LIGHT - weighing in at only 1.3lbs, this little handheld garment steamer its perfect for home or travel. 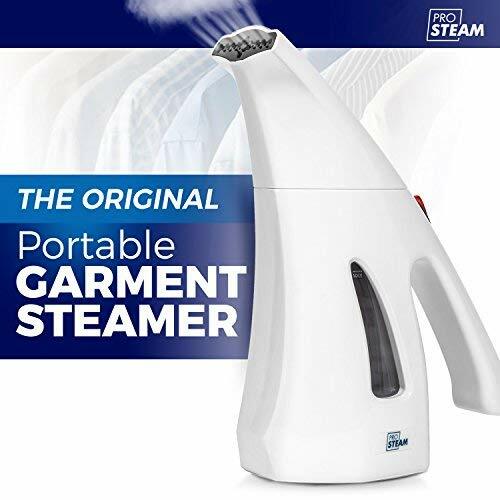 It's the best steamer for clothes in its price class, and a wonderfully convenient travel garment steamer. SAFE - automatically shuts off if it get too hot or water runs out! Safe on all types of fabric, satin, wool, cotton, nylon blends, upholstery, bedding, table clothes, and linens! 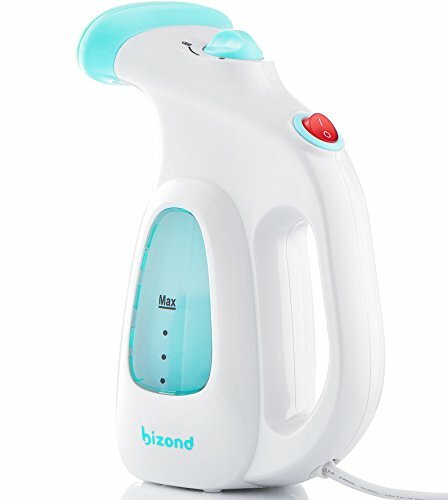 BIZOND make its portable clothing steamer, handheld with love. READY IN A JIFFY - start steaming in just 90s, thanks to the 500W heating element. The steamer holds 4oz of water for 9 to 10 minutes of steaming power! This home and travel clothes steamer will have you done ironing in no time. SATISFACTION GUARANTEE 100% RISK-FREE - We're so sure you'll love our small steamer, you can return it with no questions asked! Whether at home or traveling, the BIZOND steamer removes wrinkles and freshens your clothes safely. ❤️ 3-YEARS WARRANTY! ✿【INNOVATIVE DESIGN】Ionic can penetrate into hair core, intensively nourish hair from within to create stronger hair that's more resistant to the dry, damaging effects. Meanwhile, the 360° swivel power cord and prevents wire twining and makes it ideal for professional salon use, travel & at home hair care. Gives you a smooth experience every time. Also you can easily toggle between ℃ and ℉ by pressing the power button and the Ionic button together. 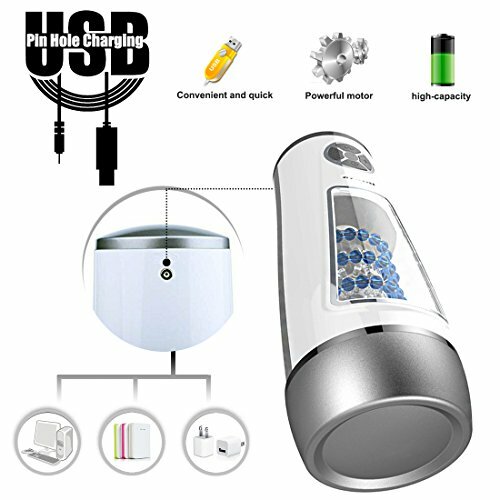 ✿【2-YEAR WARRANTY】You can clean it by your dry, clean and spare makeup brush. Keeping you satisfied is our number one goal. We are so certain you'll love this brush. You're protected by a 2-year, no-questions-asked replacement or refund guarantee and world-class personal customer service, so order TODAY! You have nothing to lose and beautiful hair to gain! 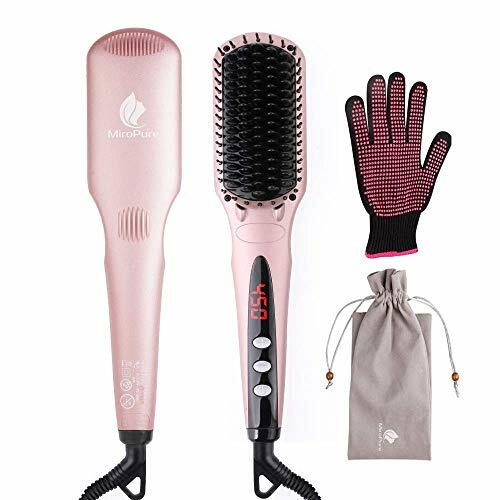 ✿【HEALTH CARE FOR YOUR HAIR】This item is an electric hair straightener brush mainly of daily care, it helps detangle your hair and straighten hair instantly while leaving behind a healthy shiny, sleek, frizz-free hair. Easily solve hair knotting, reduce pain and hair broken, repair the hair quality of harm. Achieve beautiful straight salon quality hair that will last for the entire day! Note: It gives you a silky and natural straight look and can't straighten the hair like the flat iron does. ✿【MCH HEATING】Advanced MCH heating has incomparable superiority than PTC in market, rapid, uniform heating and homothermal. 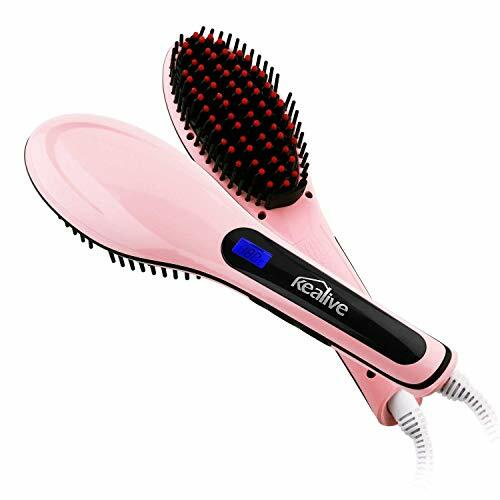 Simply turn it on, hair straightening brush temperature will be displayed on the LED screen. Wait less than a minute and then straighten your hair. The adjustable heat temperatures from 150℃(300℉) to 230℃(450℉) allow you to match your specific hair type: thin, fine, bleached, wavy or curled. Just 60s, it can heat up to the setting temperature and offer a great result! New MCH Heating: The MCH (Metal Ceramic Heater) gives even heat distribution and quick temperature recovery time. The adjustable heat temperature from 150°C (300°F) to 230°C (450°F) allows you to match your specific hair type: thin, fine, wavy or curled. In just one minute, it can heat up to the desired temperature and offer great results. HOW TO USE: Pump the mousse onto towel-dried hair and scalp. Massage quickly from the roots to the ends of the hair. Style your hair, but do not rinse it out - it's that easy! 1.Heat Protectant Spray : ArtNaturals thermal hair protector is a weightless mist to use before styling your hair with flat irons, blow dryers and curling wands Our thermal shield provides protection up to 450 degrees Fahrenheit. 2.Leave In Conditioner : This protection spray doubles as a leave in conditioner. 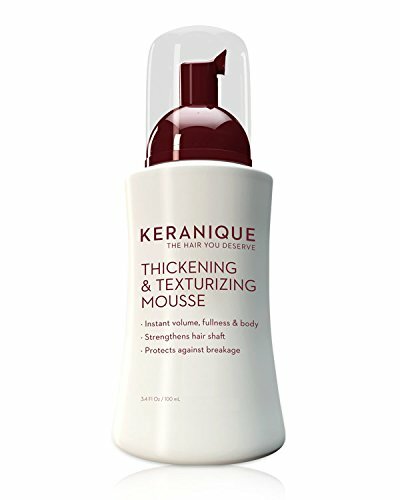 Our thermal shield hydrates your hair while protecting it from getting dry and damaged. This professional level item will speed up drying time, and boost shine. 3.For All Hair Types : Our heat protector hair spray can be used for all hair types. It is safe for straightening and curling. Fine or damaged hair, blondes or brunettes. This argan hair spray is the ultimate experience. 5.Satisfaction Guranteed: ArtNaturals offers a 100% satisfaction guaranteed or your money back. Try it risk free with no questions asked and top customer service. You have nothing to lose and your health to gain. 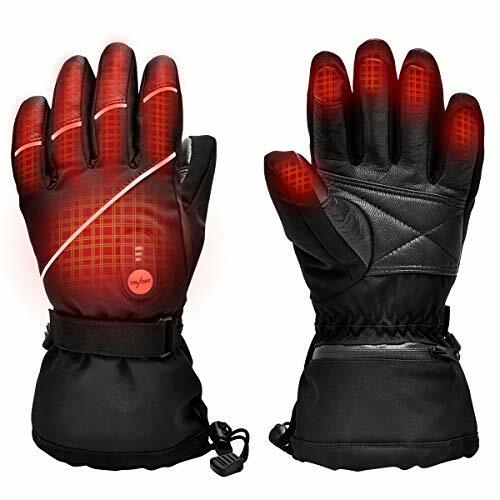 【Heating Elements Covers Whole Back of Hand and Fingers Till Finger Tips】this heating gloves upgrade to use far infrared heating elements Which can be stimulate your blood circulation . Great for Raynaud's , Arthritis , Bad Circulation, Stiff Joints People. Give you a warm winter . 【7.4V 2200MAH Rechargeable Li-ion Batteries & 3 Settings Temperature Controller】The electric gloves Include pair of 7.4V 2200MAH rechargeable lithium polymer batteries. Heating Up to 2.5-6 Hours and full charge around 3-4 hours . Also it is with 3 heat setting controller for you adjust the temperature easily . 【Warranty】1 year wanrranty.If you have any futher questions or any quality size probems , please contact us by email freey .we will more than happy to assist you ASAP within 24 hours .100% Satisfication guarantee give yourself and beloved ones a chance to say goodbye to cold hands.